Brake banjo switch for Lust Racing adjustable rearsets for Honda CBR600RR, CBR900RR,CBR929RR,CBR954RR,CBR1000RR Fireblade and Honda CBR1100XX Blackbird motorcycles. If you fit Lust Racing performance rearsets for road/street applications you need a brake banjo switch to operate the brakelight. A banjo switch operates using the hydraulic pressure in the brakeline when the brake lever/pedal is pressed. The main reason production bikes comes with mechanical switches is that these are much cheaper to manufacture. Unlike mechanical brake light switches hydraulic brake line banjo switches do not need any adjustment. In addition our high quality banjo brake light switches are likely to last the entire life of your motorcycle. Most japanese motorcycles like Honda M10X1,25 mm single brake line banjo switches for the rear brake master cylinder. Easy installation at the brake line banjo bolt. Supplied with copper washers, cable conncetors and installation instruction. 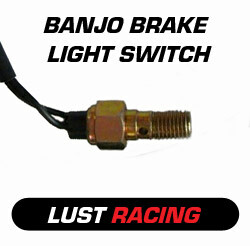 Lust Racing brake banjo switch, no need for adjustment of the brake light switch - ever! Operates using the hydraulic brake system pressure. Easy to install, connects to the rear brake master cylinder (brake pedal/lever) end. Inline banjo brake light switch, available for Suzuki, Yamaha, Kawasaki and Honda motorcycles with aftermarket adjustable rearsets. This brake light switch is activated by the hydraulic pressure in the braking system when the rear brake is operated. The switch is of hydraulic-electric type connecting a electric circuit, in this case the brake light curcuit, when there is preassure in the braking system. Fail proof operation, hydraulic preassure switched works often faster than mechanical switches. Due to the higher cost of hydraulic pressure sensitive switches motorcycle manufacturers use usually mechanical brake light switches to save production costs. Easy to connect: It is easy to connect, by connecting the two wires for the old mechanical brake switch. The switch is mounted to the rear master brake cylinder where the hydraulic rear brakeline is connected to it. The switch replaces the standard brake line connceting bolt. The switch is supplied with two copper washers that goes on each side of the brake line, to ensure no leaking. Please NOTE: The rear brake system should be bleeded after installation to ensure there is no air in the rear brake system! Bleeding the brake system is easy, refer to a motorcycle manual. 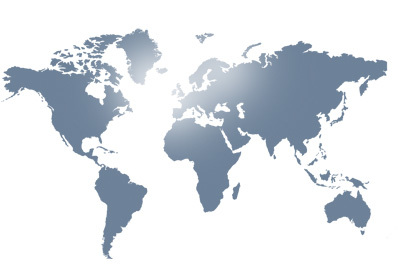 If you are unsure, leave the fitting to a professional motorcycle garage, or contact us for advice. They should be able to fit and bleed the system in less than 15 minutes.